If you are like me and struggle with getting your beloved family members to eat more vegetables, then this soup is for you. Loaded with veg and full of flavor, my husband and child are none the wiser to my diabolical plan of getting them both to eat healthier. If you want to be even more devious, you can wait until its a nice cold Autumn or Winters day before putting this out with a sandwich for lunch – under such circumstances, nobody can resist the warming sweetness of the carrots and buttery smoothness of the leeks. Wash and peel carrots and potato. Diced in pieces about 1 cm large. Split leeks down the middle with a knife and run under cold water to wash. Dice the white part of the leeks and place in a bowl. Discard the green and tougher parts of the vegetable. Melt butter and olive oil in a large pot over medium heat. Once melted, add thyme, minced garlic, carrot, leeks and potato. Season with salt and pepper and stir. Cover and leek cook on medium heat until vegetables are soft (this should be about 10-15 minutes). Make sure to check on it occasionally and give it a stir to prevent it from sticking and burning to the bottom. Once vegetables are soft, increase heat to high and add 1 cup of wine. Let bubble away on high heat for 2-3 minutes until the alcohol has cooked off and the mixture has reduced slightly. Once at a boil, reduce heat to low, cover and cook for 30-45 minutes. After simmering, turn off heat and remove from stove. Puree with a hand blender or carefully transfer to a blender or food processor to puree. Once pureed, return to soup pot and warm on medium heat. Add cream stir, and let cook for 3-5 minutes on low. Turn off heat and laddle into bowls. Serve with your favorite sandwich and enjoy. 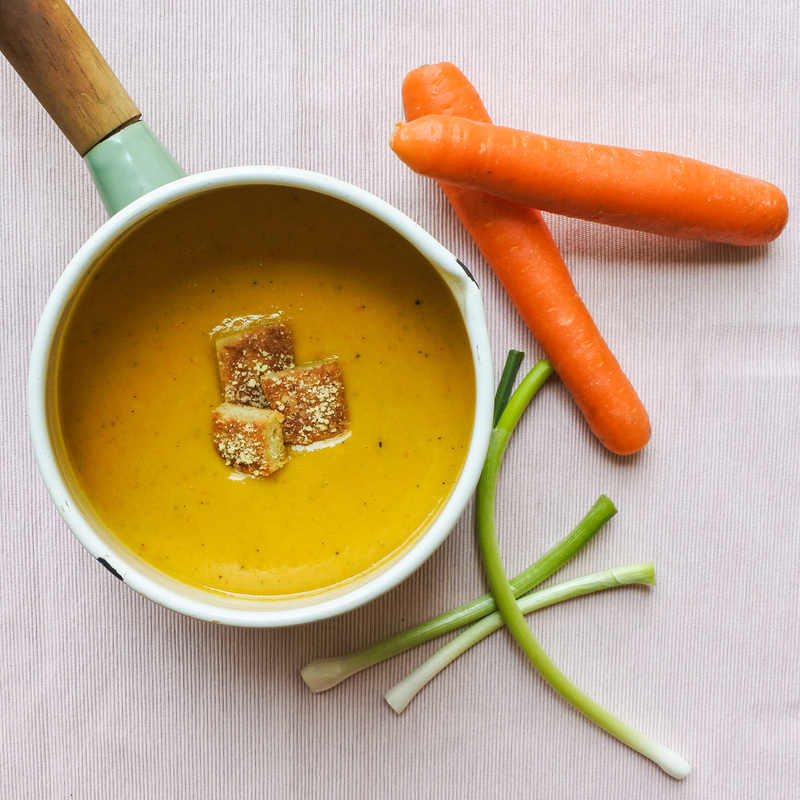 Garnish Carrot and Leek Soup with Parmesan croutons and chopped scallions. Split leeks down the middle with a knife and run under cold water to wash. Dice the white part of the leeks and place in a bowl. Discard the green and tougher parts of the vegetable. Melt butter and olive oil in a large pot over medium heat. Once melted, add thyme, minced garlic, carrot, leeks and potato. Season with salt and pepper and stir. Cover and leek cook on medium heat until vegetables are soft (this should be about 10-15 minutes). Make sure to check on it occasionally and give it a stir to prevent it from sticking and burning to the bottom.